Make an Island Oasis in your yard with Colorful Rock and Decorative Stone from Skyview Stone ! 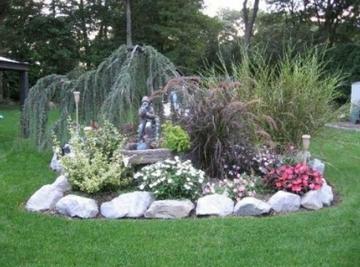 Below is a small sample of the LI Landscaping Boulders and Natural Decorative Accent Rocks. that Skyview Stone offers for your Waterfall, Pool or beautifully landscaped yard. 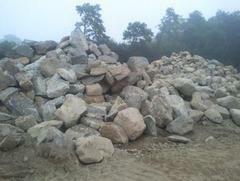 In addition, we supply Rocks & Boulders for Long Island, Suffolk, Nassau and NY Coastline Properties. Shoreline Management Rock Erosion Barriers & Jetty Rock as well for many State, Cities and Townships. As always, Skyview Stone, located in Kings Park, will load your dump truck or trailer no matter how small or large. You can purchase as little as one yard or one ton. Delivery for all of our products is available. We can arrange for small or large truck loads and tractor trailer loads. Buying by the trailer load will always be a big savings for you on Landscaping LI Boulders or Natural Rocks from other States. Decorative Accent Boulders in Earth Tone Colors with rounded edges. 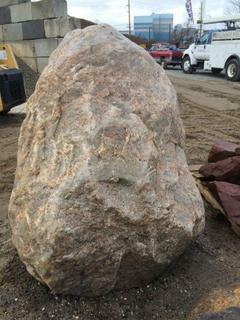 Pennsylvania Burgundy Boulders - are direct from Pennsylvania. This shale stone is a vibrant red - very much like the Colorado Red Rock Mountain Outdoor Amphitheater . All Natural and Unique, for around your Swimming Pool and Waterfall, build a Red Rock Retaining Wall, or accent the plants and trees. Jade Green Boulders - are brilliant green and will add a wonderful accent your landscape. 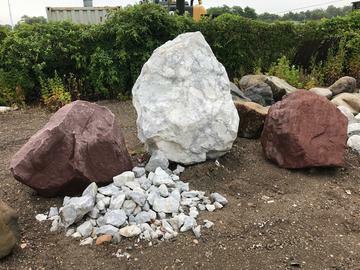 These boulders look incredible when a blanket of snow surrounds them, or set against Red Stone in your Landscape design at your home. Maryland Rosette - Add bright natural color to your Swimming Pools, Waterfalls, Rivers, Lakes or enrich your Garden or Landscape with the beautiful pink and white colors. This Marble Rock like piece will Brighten up your World one piece at a time! Have something your neighbors don't have! Adirondack River Cobbles - Natural subdued Colors which are round with a smooth surface texture. Colors are enhanced when Wet and are great for Waterfalls, Gardens, or along River Beds. Use as a border for your River Plants to bring out their Natural Beauty. Also they used to form a Circle to make a Fire Pit for Backyard Campfires. LONG ISLAND BOULDERS Have a piece of Long Island Sound in your back yard! These are 1 1/2 ft to 2 ft size LI Boulders. 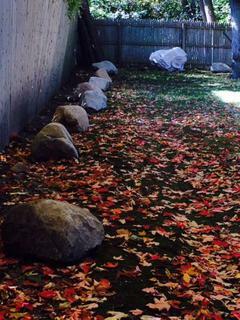 Natural LI Boulders are born and raised (formed by Long Island sand) on Long Island, left over from the Glacial Till ! Sizes range from 1 - 10 Feet in diameter. 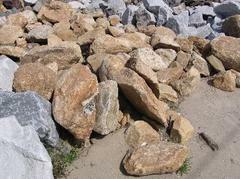 You can make Granite Rock Retaining Walls with these All Natural Specimens ! Before these Boulders grew up, they were babies, Long Island Stones we also carry in stock for you to view. Manhattan Granite Mica Rock - The granite that naturally Sparkles! Wait till you see it Wet....the Silver Sparkle and Charcoal Grey Color are Brilliant! Use them as Stepping Stones to your Garden Bed or to build your own Glistening Waterfall which could run down into your Lake or Pool. Stop in and take a look, the Sparkle will Amaze You. Pick out every Rock individually which "Talks to You" for your Personal Touch to that Special Project. Vanilla Ice Rocks - Massachussets White granite rock with some grey tones. These natural rocks love to soak up the sun, the more sun the brighter they will be. They can be a great accent to a spot in your yard that needs a little sunshine! Also great for Waterfalls and Borders. This rock is also available in two smaller Stone Sizes, 1/2" & 3/4" for Gardens, Driveways and Flowerbeds. 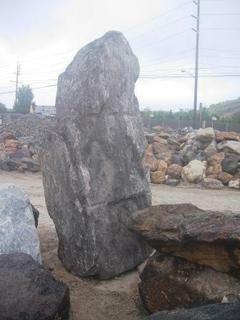 Nice tall piece of Manhattan Granite: make a vertical waterfall, landscaping accent rock, or a swimming pool dive rock ? 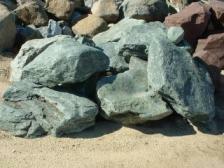 Come pick out the rocks you like, and let us know what you would like engraved into the rock. And if you would like the rocks cut in special ways, show us what you would like done. We can set the rocks at your location with our crane boom truck. Natural Amber Granite Rock would look nice in a Waterfall or in your Landscaping ! Natural Rock & Lake Water Fountains are nice for relaxing moments. 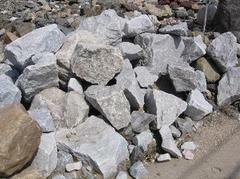 For Natural Garden Rock or Waterfall Rock, come to Skyview Stone and choose the right Rock for You. This Piece of Manhattan Granite Rock makes a nice outdoor table. Skyview Stone makes small and bulk deliveries. This next load of stone could be brightening up your landscape! Why did Jesus say " the rocks would cry out " ?